Above: PNTA-Job Corps Crews helped restore the PNT/ Devils Ridge Trail. As we spend more time in cyberspace, youth programs that coax young folks away from screens and into the woods have become urgently needed. 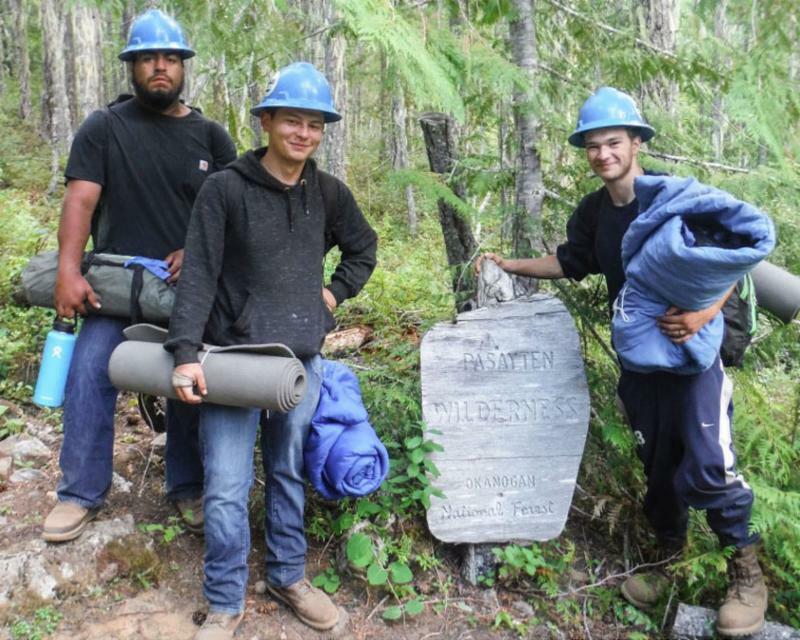 The Association’s Quilcene Ranger Corps program offers a rare win-win scenario by helping to solve two problems at once; giving trails much needed maintenance, and fostering trail and environmental stewardship skills in the potential future managers of our wild places. 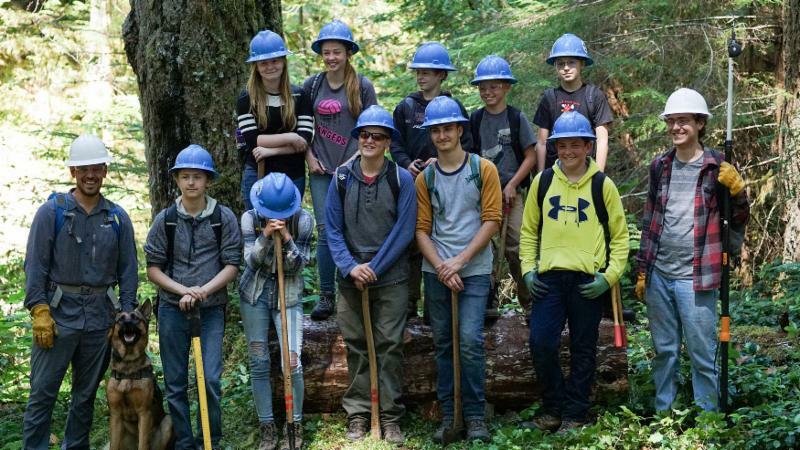 Each year, the QRC offers middle school-age students the opportunity to volunteer on the Olympic National Forest . Four days a week, crews meet at the Hood Canal Ranger Station before shuttling off to Tubal Cain and other trailheads on the Peninsula. 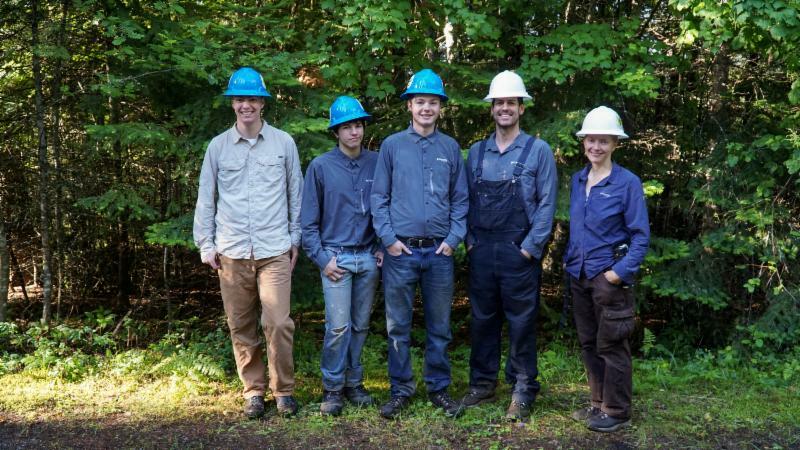 Read about how Rangers spent their summer working on the PNT this year, and how they helped out volunteers with the Back Country Horsemen of Washington , Gray Wolves Trail Association , and WTA replace a large footbridge—a project seven years in the making. Kristin Ackerman (right) and the 2018 Performance Trail Crew. This August, the Association added a new full-time staff member to our team. Since 2012, Kristin Ackerman has co-led PNTA trail crews in Eastern Washington with her husband Bodhi. As a Crew Leader, she inspired local youth to spend their summers outdoors working on the Pacific Northwest Trail, teaching them trail stewardship and backcountry living skills while camping out on the trail—often for a week or more at a time. In her new role as Regional Coordinator, Kristin will work with agency partners and local volunteers to provide regional oversight of the Pacific Northwest Trail System. Based out of the USFS Three Rivers Ranger District office in Kettle Falls , she'll establish a full time presence for the PNTA in the region. We are pleased to welcome Kristin to our team, and to add organizational capacity that will allow us to focus on projects that will leverage local resources in the enhancement of the PNT in Eastern Washington . Show your love for America’s National Scenic Trails with collectible gear and apparel from REI. Although the collection primarily features “Triple Crown” trails, sales will help support all eleven National Scenic Trails through a generous grant program funded by REI . This limited edition gear is only available while supplies last. 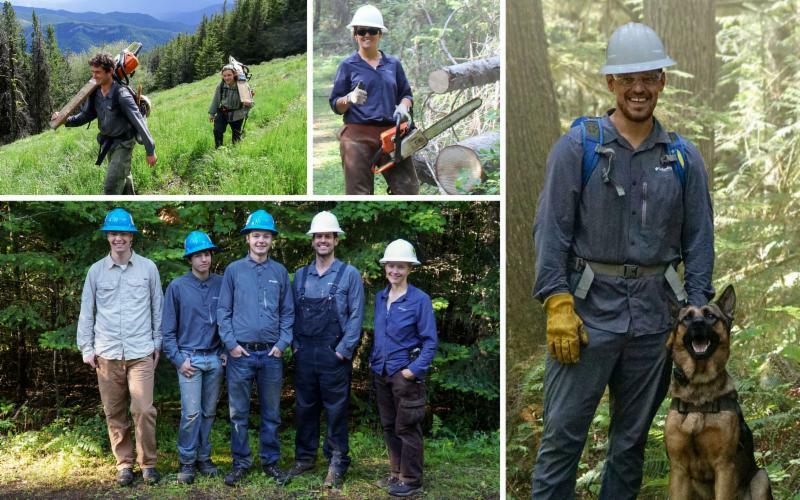 Above: Our Trail Crews stayed cool this summer thanks to Columbia Sportswear. PNTA Trail Crews have a new look this season, thanks to a generous donation made by Columbia Sportswear and new helmets provided by the Association. Columbia provided thirty Featherweight Hiking Shirts to our Crew Leaders and Performance Crews, valued at $3,000 dollars. Above: The PNT in the Kettle River Range. Photo by Tyler Yates. The Land and Water Conservation Fund is America's most important conservation program, yet without action from Congress, it will expire on September 30, 2018. For over fifty years, the LCWF has provided vital funding to protect irreplaceable lands, and create access to outdoor recreation opportunities in nearly every state, including Montana , Idaho and Washington . Programs to enhance the National Trails System have also been supported through the Fund. Over the last 15 years, approximately $25 million from the LCWF has been used to acquire and permanently protect more than 18,000 acres along the Pacific Crest Trail. The Fund has helped to ensure access for PCT users, and to facilitate a world-class long-distance hiking experience by increasing the amount of trail on public land. 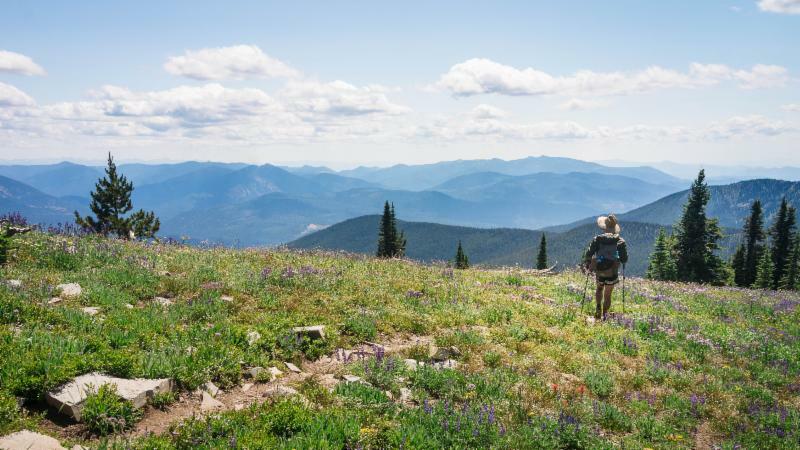 As one America’s newest National Scenic Trails, the Pacific Northwest Trail could also benefit from permanent protection through LCWF investment. While 80% of the trail corridor falls on public lands, remaining areas include a significant amount of private property. Where the PNT crosses land in private ownership, access is currently provided through voluntary agreements, which may be revoked at any time. Voluntary sales of private land funded through LCWF could help ensure access to non-motorized routes and reduce the amount of trail which currently follows public roads and highways. Take action today. Sign on to our partner’s letter at the Land and Water Conservation Fund Coalition . If Congress allows the program to expire this September, it could forestall efforts to create parks, connected pathways and other important programs. Join us at The Mountaineers for a presentation about the Pacific Northwest Trail by PNT thru-hiker, Brian Lewis . PNTA Staff will join the Mountaineers for the event and answer your questions about America’s wildest National Scenic Trail. The Mountaineers Walking the Wild series features storytelling and great photos from extraordinary adventures on foot by Mountaineers members in the wilds of the world! You’ve heard about the Pacific Crest Trail (PCT), but did you know that there is another National Scenic Trail that runs through Washington State? The Pacific Northwest Trail (PNT) is a 1200-mile trail that runs from the Washington Coast along the northern parts of Washington, Idaho, and Montana, up to the northeastern corner of Glacier National Park. If you have been dreaming of doing the distance on one of the country’s newest and most diverse scenic trails, or you haven’t heard of it and want to know more, join us for the next Walking the Wild Presentation with Triple Crown hiker Brian Lewis for an evening of fantastic photos and stories from his 1200 miles on the PNT! Tickets are required to attend – Mountaineers and PNTA Members $10, general public $15. To hold your seat for this very special event, please register below. A variety of snacks, soft drinks, beer and wine are included in the price of your ticket! Follow us on social media for trail updates, pictures and fun! Use the hashtag #crowntocoast and we'll share your PNT pictures. You can support the Pacific Northwest Trail Association just by shopping at REI.com and REI-OUTLET.com . All you have to do is click on the REI logo in this email and shop! Fred Meyer Community Rewards is "where shopping and giving unite." You can support the Pacific Northwest Trail Association just by shopping at Fred Meyer with your Rewards Card. All you have to do is link your Rewards Card and scan it every time you shop at Fred Meyer. AmazonSmile is a simple and automatic way for you to support the Pacific Northwest Trail Association every time you shop, at no cost to you.